Health and fitness has always been a part of my life. For years, I worked out at traditional facilities and really struggled to find my place there. I would often time feel uncomfortable trying to squeeze in at a weight bench or a free weight area with men all around. Regardless, I understood the importance of living a healthy lifestyle and how regular exercise plays a part in that, so I would do what I had to do. But all of that came to a screeching halt in 2009 when I was diagnosed with Stage 2 Breast Cancer. Following my diagnosis, I wasted little time in moving towards beating it. I consulted with my oncologist and had a bi-lateral mastectomy followed by rounds of chemotherapy. After treatment, I developed Axillary Web Syndrome (AWS), also known as cording. Cording is a possible side effect of breast surgery that comes with the removal or partial removal of a lymph node or multiple lymph nodes, which can cause pain, discomfort and sometime even restrict arm movement. To get some relief from the cording, my breast surgeon told me that the physical therapists at Woman’s could help alleviate the cording. To be honest, I was hesitant, unsure and a little worried. Chemotherapy had taken such a toll on me and I felt so weak, I wasn’t sure what I would be able to really do. But, I listened to my doctor and am so glad I did! When I got there, the staff was so welcoming and helpful. Chalice, my therapist, knew exactly what to do and was great to work with. We worked together for several months, building up my strength and confidence. I noticed that as my confidence in my physical ability improved, so did my overall attitude and outlook. I enjoyed my therapy experience so much that I decided to become a fitness member at Woman’s Center for Wellness. Finally! I found a place where I could work out without the fear of judgment or awkwardness from those around me. I instantly felt like I belonged. The women-only environment is so welcoming! The fitness staff is extremely helpful, they are always willing to assist as they can and do what they can to make your experience better. The facility is always clean, the equipment is great and they are always working to improve it. In January of 2018, we discovered that my cancer had returned. This time more aggressive, found in my bones and liver, being re-diagnosed as Stage 4 Metastatic Breast Cancer. 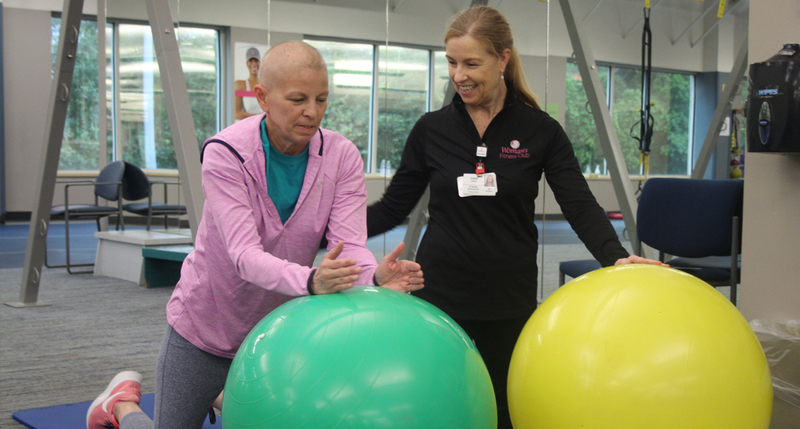 While meeting with my oncologist, she strongly suggested that I continue to work out and stay active to help fight the fatigue that comes with chemotherapy treatments. She also told me about a therapy program designed specifically for cancer patients at Woman’s Center for Wellness. 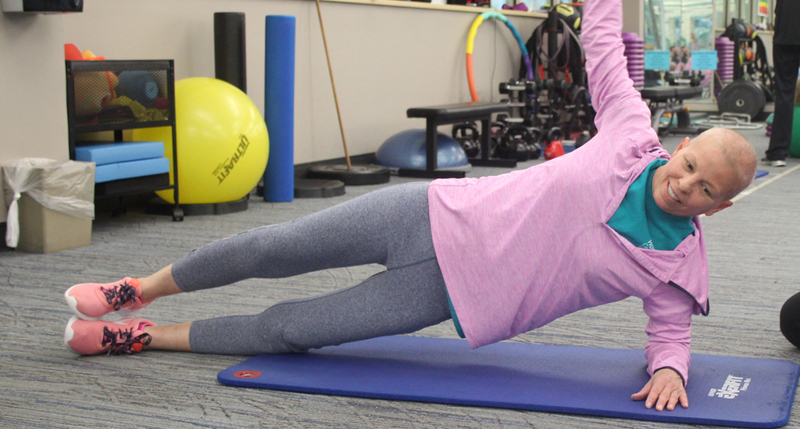 At the time, I didn’t feel confident enough in my balance and strength to continue my regular workout routine, so I decided to try therapy again. I was elated to hear that Chalice would be my therapist again and that we would be working together to rebuild my strength. She and I worked together doing several different strengthening exercises, taking our time and building up bit by bit. This was much more comfortable to do one on one in the therapy gym, until I felt ready to move into the regular gym area. Once I felt strong enough to move out of the therapy program, I began personal sessions with a personal trainer, Dawn. I really like working with Dawn! She and I are still working to improve my strength, but Dawn is also working to increase my endurance. She develops different workout plans for me that keep me motivated and keep me interested in the routine. She’s extremely supportive, often doing the exercises right along with me, which is helpful and makes the workouts more fun. My fitness routines with Dawn often consist of about 20 minutes of cardio, then a mixture of core exercises, machine exercises and free weights. 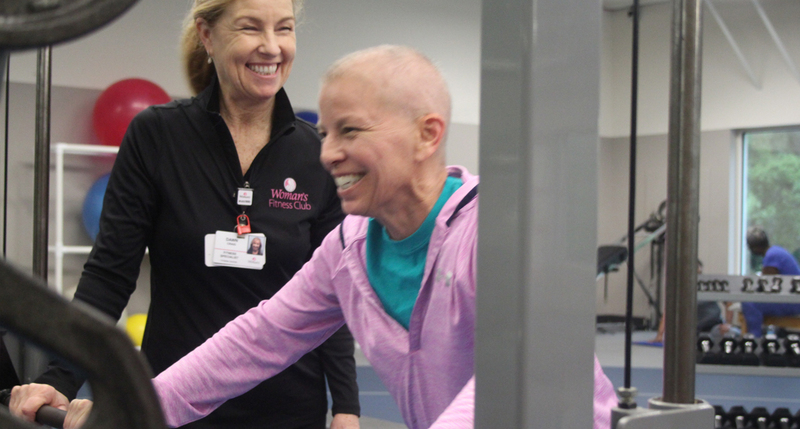 While the recurrence of my cancer isn’t something I had hoped for, the physical strength I’ve gained at Woman’s Center for Wellness has helped fuel my mental strength to continue fighting to beat it again. Being a fitness member, surrounded by such great women, continues to give me the confidence I need to keep pushing forward, providing me an energy and yet, a calmness that I need in life. There’s really no other place like it! ← Is it the Baby Blues or Postpartum Depression?